Quick Takeaway: The 4-hour Workweek is a springboard that allows readers to know that anything is possible. The book ignites an interest in the reader to look at how we can find ways to succeed beyond the normal routes. It inspires people to step out of the standard 9-5 lanes that society says is best and provides examples on how to find more fulfilment (and excitement and success) within our lives. Why I read this book: It was given to me by a friend, Kirk Rau. Book Report: If you are like me and the millions of other people who have been inspired by Timothy Ferriss, you know that The 4-Hour Workweek isn’t just an autobiography highlighting the amazing feats of Tim Ferriss. You also know that it isn’t just a book describing how to live an amazing life. Rather, The 4-Hour Workweek is the start of an entirely new way of thinking. The 4-Hour Workweek does highlight Ferriss’ amazing life and it is an instruction book on how to travel around the world for less money than you think and how to get time off from work, work remotely, or even start your own company but more than that, this book inspires the reader to think differently and to figure things out for themselves in order to make all of our lives both more interesting and better. Starting out with a few anecdotes on how he became a Chinese Kickboxing world champion and a Tango champion ballroom dancer in Argentina, you’d think that Timothy Ferriss spent years mastering the skills needed to accomplish these amazing feats, but this is not the case. In The 4-Hour Workweek, Ferriss shows how he figured out shortcuts on accomplishing great things in less time and with less energy than everyone else. The book becomes a toolkit for the inspired to follow in order to become one of the “new rich” or those wealthy not only in terms of money in the bank but in terms of balance and life-experiences. The 4-Hour Workweek is also a resource showing step-by-step how Ferriss figured out how to accomplish more without working harder, but rather by working less with a more strategic plan and focused goals. The book is indeed an inspiration. Quick Takeaway: The Power of Meaning: Crafting a Life That Matters by Emily Esfahani Smith is a very thick description of the human search for meaning. The book explores a brief history of meaning seekers from Sufi darvishes to Tolstoy, Albert Camus, and modern-day researchers. After a brief discussion regarding why the search for meaning in current times is so elusive, Esfahini Smith outlines four basic pillars of meaning that she claims are accessible to both people with or without faith. These four pillars are: Belonging, Purpose, Storytelling, and Transcendence. With detailed examples of how people have found meaning in these pillars, Esfahani Smith allows the reader to see how finding meaning for themselves is possible. Book Report: From the first pages of The Power of Meaning: Crafting a Life That Matters, I knew that I was going to like the book. Sensing that it was going to be a book that weaves multiple layers together to form an entire product, I forced myself to slow down and really take everything in as I read. I’m glad I did this, and the book didn’t disappoint. Near the very beginning of the book, Emily Esfahani Smith highlights two human questions, “What is the meaning of existence?” And, “How can I lead a meaningful life?” She states that “religion was once the default path to meaning,” but today, with fewer people adhering to a religious base, the search for meaning has become more urgent, yet also more elusive. Esfahani Smith furthers this point by highlighting that at universities prior to the twentieth century, students participated in a “great conversation” of how to live life through literature and philosophy, but a twentieth century shift in specialization of scholarship removed many students from conversations of broader meaning. Happily, Esfahani Smith shows that with the work of psychologists like Martin Seligman, Baumeister, Huta, and philosophers like Robert Nozick, and organizations such as Life is Good and Storycore, there exists a movement whereby certain individuals are inserting Meaning back into the conversation, and near the end of her book, Esfahani Smith states that this trend might actually end up to be a major positive cultural development of our age. One of the first striking distinctions Emily Esfahani Smith points out in The Power of Meaning is an experiment showing that if given the choice, pretty much no one would choose to live in a (fictitious) “happiness tank”, filled with joy, for the rest of their lives. Rather, people would choose to take what comes in their lives, and this quickly debunks the idea that happiness and meaning are the same. Meaning is somehow beyond and more fulfilling than happiness. 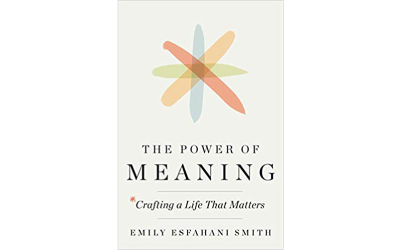 Near the end of the introduction, Esfahani Smith states, “there are sources of meaning all around us.” And, she claims that The Power of Meaning will reveal those sources of meaning and show how the reader can harness them to add meaning to their lives. The first chapter looks at The Meaning of Crisis with examples of great tragedy, paralysis from accidents, for example, that ended in positive, meaningful, fulfilled lives. This chapter is followed by four chapters each dealing with what Emily Esfahani Smith describes as the four pillars of meaning, and these pillars are: Belonging, Purpose, Storytelling, and Transcendence. Esfahani Smith shows that these pillars of meaning are central to religious and spiritual systems, but they are accessible to everyone who can find meaning by harnessing meaning with these pillars in mind. It is here that I have to avoid my temptation to write all about everything Esfahani Smith outlines in these chapters because it was so fun to read all the examples, and it was exciting to be part of the “ah ha” moments in these chapters, but for your, and my, benefit, I’ll simply state a few points. Belonging, for example, is shown to be even more important than food or shelter, and meaning isn’t something we create for ourselves, but with connections with others, we build meaning for both ourselves and others. Similarly, the pillar of Purpose is largely exhibited by helping others, and a job can be something totally different depending on a person’s outlook. A janitor for NASA, for example, might look at his job as cleaning toilets, or he can look at it as helping get a human into space. Purpose is shown in this chapter to focus on a broader mission of helping others than a narrow idea of doing another day-to-day task. In the chapter on the pillar of Storytelling, Esfahani Smith shows many examples of how storytelling adds meaning to people’s lives, and she highlights different groups or organizations that have helped people find meaning by revealing moments that have shaped them. In the end, as moths are attracted to light, humans have been attracted to telling each other stories for thousands of years, and this action acts as a powerful tool to allow one to feel a sense of lasting self-recognition, but a powerful story can add meaning to others too, and when a speaker and a listener connect on some level, both are comforted that they are not alone. Transcendence was a fun chapter to read. Examples of transcendence ranged from stargazing to meditation to hallucinogenic drug use, and examples of experiments showed that just after experiencing a moment of “Awe”, a person’s perception of themselves is more positive. And, from John Muir staring at a grove of trees to a monk meditating to Timothy Leary taking LSD, the key component is that The Self washes away and “ego death” occurs. This connects a person to others and to everything. Strangely, the moment when one seems to realize what a tiny, insignificant speck of the universe they are, they don’t feel meaninglessness or angst, but rather they feel a connected sense of peace. Although Growth isn’t listed as one of the pillars of meaning, Esfahani Smith dedicates a chapter to how growth is a key component of the pillars as growth is often the catalyst to action whereby a person who might had forged meaning through suffering would dedicate their lives to helping others in similar situations. In a chapter called Cultures of Meaning, Esfahani Smith highlights great examples of people coming together to discover meaning, but she also warns that not all cultures of meaning are positive. Rather cults, hate-groups, etc. might use the same four pillars of meaning to create a sense of belonging, purpose, etc., but hate is hate, and evil is evil, so although the same exact pillars are used, the contribution to society is not healthy. However, positive movements like “Conscious Capitalism” show that purpose-driven entities can make the world a better place with more meaning in more people’s lives. Near the end of The Power of Meaning, I was really faced with a moment of existential anxiety. For some reason, a statement by end-of-life psychiatrist William Breitbart really struck me: “Meaning and death are two sides of the same coin.” As I read this, I was immediately struck with a confrontation of the finite and infinite at the same time, and for some reason, I wanted to keep thinking of them as separate. It wasn’t the only time The Power of Meaning made me take a deep breath over a concept, but it was, for me, the most striking, and as I began to process meaning from both the finite and infinite perspective, my mind immediately was drawn to the tapestry that The Power of Meaning wove. The book somehow provided small answers that made the existential question, “What is the meaning of existence?” and the practical question, “How can I lead a meaningful life?” a lot easier to process. For me, with a cultural-religious perspective believing in the existence of life on earth and life after death, I was reminded that I grew up with the four pillars of Belonging, Purpose, Storytelling, and Transcendence, but I wasn’t conscious of these nor of the exact characteristics of them. The Power of Meaning showed how easily one can consciously orchestrate meaning by simply intentionally putting ourselves in situations surrounded by these pillars. The conclusion of The Power of Meaning, very appropriately, re-visits the book, Man’s Search for Meaning, by Viktor Frankl and shows that if we understand the Why of our existence, we could understand the How, and the Why for Frankl, while he was in the Nazi concentration camps, was that “life was still expecting something from him” and that “love is the ultimate and the highest goal to which man can aspire.” Emily Esfahani Smith seems to agree, and she ends The Power of Meaning by stating that Love is at the center of a meaningful life and that Love is part of all the pillars of meaning. She expresses this thought so beautifully in the last three paragraphs of her book that I won’t try to reproduce it. It would be a disservice to anyone who decides to read the entire book because it so nicely wraps up the eloquent narrative of her work and shows how entirely simple it all is. Quick Takeaway: The Magic of Thinking Big is a great book for anyone wanting to change their way of thinking and acting in order to reach very large goals. It explains how, with Big Thinking, anything is possible. 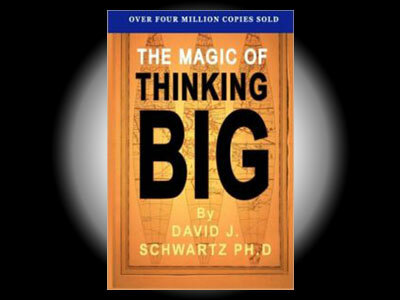 Schwartz explains how the Thinking Big concept works, and he highlights practical steps on how to do it. Book Report: Schwartz’ 1959 book The Magic of Thinking Big still inspires both thought and action with a contemporary feel. With a popular trend starting with Simon Sinek’s 2009 TED Talk and book, Start With Why, Schwarz begins his book by asking, “Why this big book?”, and he points out the goal isn’t to teach business techniques on how to make money, rather he reminds us that the WHY for the reader is ultimately to reach success, fulfill desires, enjoy a fine standard of living and that happiness, accomplishment, income, friends, and respect are outcomes of Big Thinking. Schwartz clearly exhorts his reader to “Start now, right now…” Schwartz explains, in his book, that waiting for everything to be perfect before taking action is a good excuse not to work toward your goals and that “Tomorrow, next week, later are synonyms with the failure word Never.” The Magic of Thinking Big is really an elaborate checklist on mental behaviors that if followed, practiced, and acted upon will lead to immense rewards, larger than imaginable without the Big Thinking attitude of “I can do better” which, according to Schwartz, switches on magical creative power. -We underestimate our own brainpower, and we overestimate the other fellow’s brainpower. -Make everything about you say, “I’m confident”, even if you might not feel confident inside. -Remember, ideas alone won’t bring success. -Think progressively toward, Work, Family, and Yourself. -Whenever setback, negativity, or fear creep into your mind, THINK BIG, and in his book, Schwartz tells us how. The Magic of Thinking Big isn’t an esoteric explanation of success strategy, but rather it is an objective HOW TO book with very practical steps people can take to create positive changes through Big Thinking. Many of the chapter titles are unashamedly titled, “How toThink Big, How to Think and Dream Creatively, How to Turn Defeat into Victory, How to Think like a Leader …” and Schwartz backs this up with clear explanations and practical examples. Overall, I found The Magic of Thinking Big to be a wonderful book that really allowed me to analyze how I think, to reorder my thought process putting Big Ideas ahead of smaller ideas as well as negative thoughts, and very importantly, it inspired me not to think of these concepts as fun to know, but rather as action items that must be started immediately to quickly begin making steps toward extremely big goals. 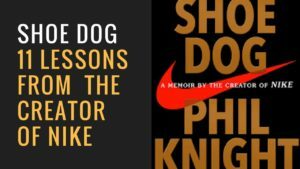 Quick Takeaway: Shoe Dog, A Memoir by the Creator of NIKE, by Phil Knight dispels any thoughts that America is an entrepreneurial Shangri-La where a good idea turns to money quickly and easily. Rather, Knight claims that entrepreneurs are always outgunned and outnumbered by naysayers and businesses trying to thwart success with “No’s” and other roadblocks. 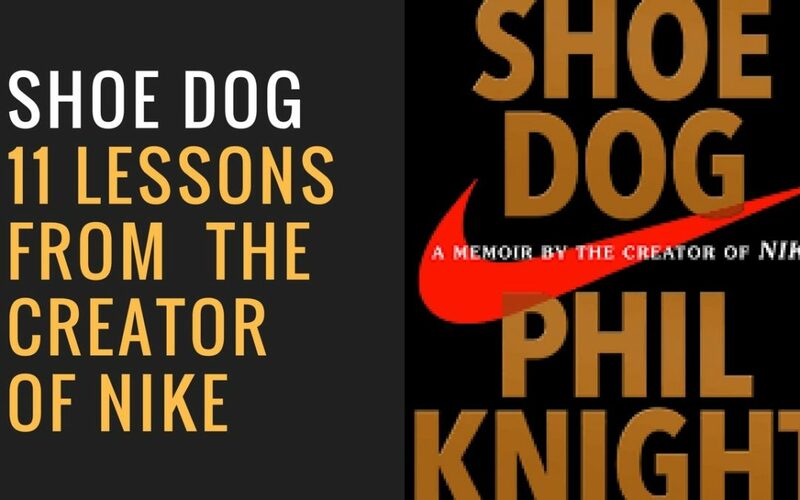 Shoe Dog is a wonderful book showing Phil Knight’s uphill battle that turned a crazy idea within the head of a young man searching for meaning into a megabrand, multi-billion-dollar company. Book Report: Shoe Dog is, simply put, a very fun read. This memoir does a great job highlighting the adventure that is the life of Phil Knight, creator of Nike. The book highlights Knight’s desire to explore as a young man, and it highlights his manic drive for success, but the book is also written with a humble attitude that makes the reader root for the underdog, forgetting that Knight succeeded in the end, becoming one of the richest individuals on the planet. Another interesting aspect of Shoe Dog is the reader learns how much happened before Phil Knight’s shoes were even called NIKE. We learn about his multiple travels and the motley crew that helped Phil propel his idea into the household name Nike is today. The reader also learns about some of Phil’s challenges. He failed at multiple sales jobs, but he succeeded in selling shoes. Why? Because, according to Knight, he realized that he wasn’t selling. He believed in running, and he believed that if more people ran, the world would be a better place, and he believed that his shoes were better to run in. Knight writes, “People, sensing my belief, wanted some of that belief for themselves … Belief is irresistible.” And, this belief can apply to anything. Belief alone doesn’t guarantee success, however. In Shoe Dog, the trials of Knight’s extremely difficult dealings with Japanese Corporations and American banks shows that any wavering would certainly lead to failure, but fighting through overwhelming obstacles is necessary to win. Many times, Knight’s company was on the cusp of failure, but with a passion and a lot of hard work, he was able to keep it alive. At the end of Shoe Dog, as Knight reflects on his book, his life, his adventure, his success, he does reveal one secret regret—that he can’t do it all over again. Quick Takeaway: How to Make Millions with Your Ideas is a pull-up-your-boot-straps-and-go-to-work type of book. However, this book is not just about working hard. 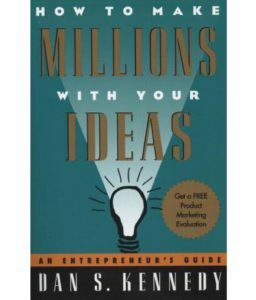 It as about using your ideas to surpass others, and it is about taking ordinary business concepts to extraordinary levels by focusing on Millionaire-Maker Strategies which Dan Kennedy clearly explains. 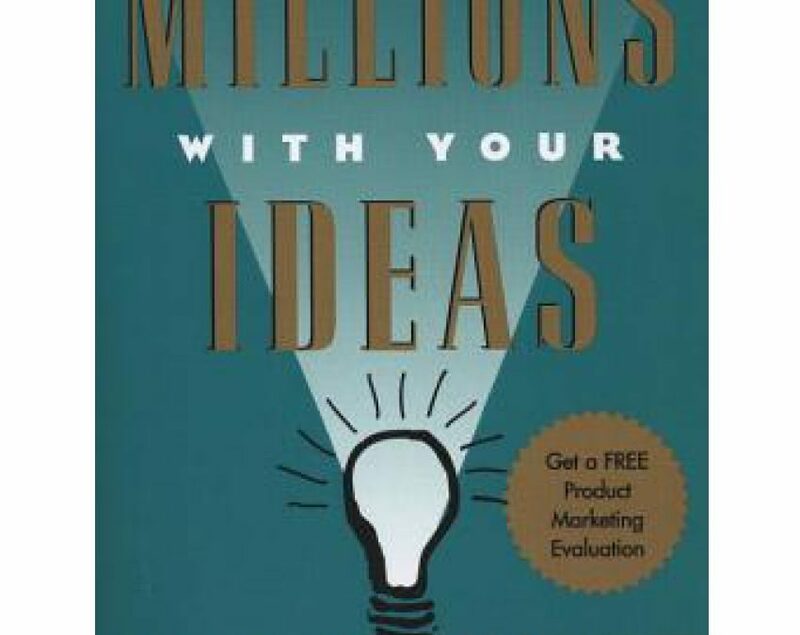 Book Report: Written in 1996, How to Make Millions with Your Ideas has an old-fashioned salesmanship feel to it, however this should not preclude anyone from reading and learning valuable strategies from a proven millionaire who is passionate about making money and teaching others how to do the same. How to Make Millions with Your Ideas might have a bit less of the feel-good motivational rhetoric in other books on entrepreneurial success, but it is certainly not short on practical advice on how to succeed. After highlighting eight high-probability areas of opportunity for millions of dollars to be made, one of the first concepts in the book is that not everyone has to be a progressive innovator who creates a game-changing product. Rather, Kennedy shows that it can be much easier to take an ordinary business and do something different with it. His case study for this is an ordinary plumbing company in an ordinary, small town that, by doing things differently from others, ended up becoming one of America’s fastest growing companies. Other case studies include ThighMaster, Domino’s Pizza, and Barney (the children’s TV character). With these examples, Kennedy highlights that 1) there really isn’t a magic product that just takes the country by storm, but sometimes failure before creativity is involved in hugely successful products, 2) that figuring out what services customers would value that aren’t offered can lead to hugely successful profits, and 3) that refusing to quit when traditional methods of distribution (or anything else) reject what you have to offer can lead to amazing multi-million-dollar results. Diversify in marketing to fully exploit Total Customer Value. Provide the customer with an exceptional guarantee. Get others to do your selling for you. Do not undervalue what you know. Other important components of How to Make Millions with Your Ideas deal with marketing, distribution, and even selling a company. All these are shown with practical tips on what Kennedy has found to work in his own experience and while working with countless other businesses, and he simplifies things by providing practical lists on exactly how to accomplish certain tasks such as exclusively controlling your products, getting involved in direct marketing, and getting valuable publicity. After all the practical advice on starting, growing, and selling a business, Kennedy provides the reader with his Million-Dollar Rolodex which is forty-five pages of contacts regarding product sourcing, mail-order marketing, trade publications, trade shows, distribution channels, publishers, advertising placement, and many other resources. Of course, many of these “contacts” are outdated, however running through his categories is a good way to see what types of companies/services are available to help grow companies. Through his stories and advice, Kennedy ignites the entrepreneurial excitement of possibility within the reader. Near the end of his book, Kennedy explains that he never had a college education nor did he have any formal training, rather it was his ideas that made his millions, and it is his goal that by keeping focused on big ideas and practical strategies, anyone can make millions with their ideas too. Quick Takeaway: The E-Myth Revisited is a nuts-and-bolts book about small business management and entrepreneurship. After craftily dispelling certain “myths” about business ownership and identifying and explaining key components linked to successful enterprises, Gerber wraps it up by considering meaning in the big picture. He highlights how owning a business can act as a bridge between our internal sense of self and the rest of the outside world. 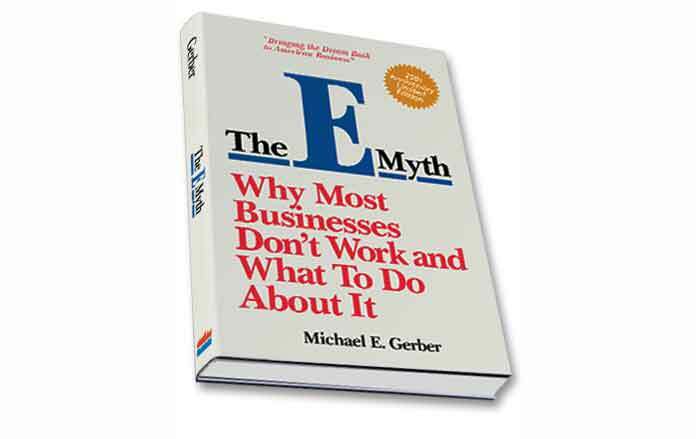 Book Report: Michael Gerber did an amazing job weaving very different ways of communication through The E-Myth Revisited, so his reader is at some points gleaning practical information and is at other points being shown how human business owners are. The book is one part text book and another part narrative. The small business and entrepreneurship messages are extremely clear, but the book also explores the emotional thought process of a struggling entrepreneur who seems to be wondering why she started a business in the first place. Gerber points out there is a myth that there is something special, intelligent, and unique about entrepreneurs, but this really isn’t true, and by following a very clear step-by-step development process, anyone willing to give time and attention can flourish in business ownership. Gerber also states early on that a business is nothing more than a reflection of who the owner is. Another concept in The E-Myth Revisited is that ”everyone who goes into business is actually three-people-in-one: The Entrepreneur, The Manager, and The Technician.” With this in mind, the Entrepreneur is the visionary, dreamer, and lives in the future of possibility. The Manager is pragmatic and provides order, and the Manager lives in the past, resisting change. The Technician is the one who gets things done, tinkers with things, and is always busy. The Technician lives in the present. According to Gerber, there is always a constant struggle for control between these three roles, and unfortunately, his experience leads him to believe that “the typical small business owner is only 10 percent Entrepreneur, 20 percent Manager, and 70 percent Technician.” This imbalance leads to more work rather than more success, and the owner realizes that he doesn’t own a business, he owns a job. There are quite a few other powerful concepts highlighted in The E-Myth Revisited, but another main concept is the flow of a business from Infancy to Adolescence to Maturity. Basically, Gerber believes that if a person wants to build a large company, the person should not think about the company as it is in the moment, but rather as the owner envisions the company. From the very start, the entrepreneur should create a robust Organization Chart, for example, even if that means that his or her own name is placed in ten different roles on the chart at the beginning. Also, there is a critical point which Gerber named “Beyond the Comfort Zone” at which time the owner has to deal with a loss of control because the company can’t be managed by a single person, and this is a huge point leading into the next topic called The Turn-Key Revolution. The Turn-Key Revolution proposes that a successful company should be created out of order rather than chaos, and the owner should look at his or her company as a prototype that could be replicated easily without the owner, so the owner is working On the company rather than In the company. Gerber doesn’t stop there, however. He clearly explains a process to do just that through three distinct yet integrated activities: Innovation, Quantification, and Orchestration. The creativity, tracking of everything, and elimination of choices once order is found are the backbone of successful companies. 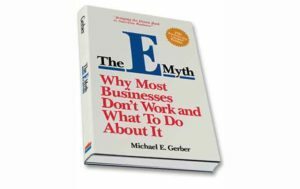 Marketing is one of the last major components in The E-Myth Revisited, and Gerber highlights objective things to think about and strategic approaches to marketing including the idea that people don’t buy products, they buy feelings and much more. Gerber also gives us a nice glimpse of his life as a young adult who drifted around a bit with a beard and a guitar and who ended up in Silicon Valley only to realize that not only did he know nothing about what was happening in technology, but none of those working in the tech revolution did either. His ah-ha moment was a changing point in his life, and one that really humanized the way Gerber looked at systems (including businesses). At the end of the book, after learning all about systems and processes, and success formulas, the reader is taken to the idea that business is a game, and businesses should be created with rules that make the game worth playing. In the end, a company is a representation of the individual who created it, and this can be a beautiful thing. Gerber points out that the first order of business for his book isn’t your business. You are. He writes that before business owners determine exactly what they will do, they should ask themselves the important questions such as: What do I value most? What do I want my life to look like? Who do I wish to be? These answers will help the owner design the best possible game for their life which ultimately will also become a reflection of who they are.